Prefabricated housing has seen a surge in popularity over the last few years as an affordable, eco-friendly and modern alternative to custom stick-built housing or suburban tract homes. Although prefab construction has experienced a recent spike in popularity in this past decade, the idea of prefabricated building construction is nothing new – prefab designs have been around for over a century, embedded in the history of the modern architecture movement. In order to really understand prefab housing, we’re going to dive into a history lesson and take a look back at the prefab home movement during the last century. Inhabitat is pleased to announce the launch of a brand new six-part series, The Green Guide To Prefab Housing, where we are enlisting the expertise of graduate architect, former Lindal Cedar Homes CEO and green design consultant Michael Harris. In our first three installments, Michael introduces us to the prefabricated home as a modern, green design alternative, analyzing the roots of factory-made housing and how its core concepts have converged with the precepts of sustainability and modernism. How has factory-built housing been informed by modernism and the green movement? And how has prefab construction influenced green, modern design? Jump ahead to part one this series where Michael will take you on an in-depth tour of a particular type of prefab package; the kit-home. The prefab industry includes producers of different home types that generally fall into two categories: Kit Homes and preassembled / prebuilt structures. Both these categories were born and developed under vastly different traditions and each offer different benefits to consumers. The difference between the two types is basically in how assembled the house is when it is moved onto your site. Is the house arriving at the site as a fully built house or a ‘kit of parts’? (By contrast to this, a traditional stick is constructed on site, and all materials are measured, cut and assembled on site – which is a really inefficient use of time and money). 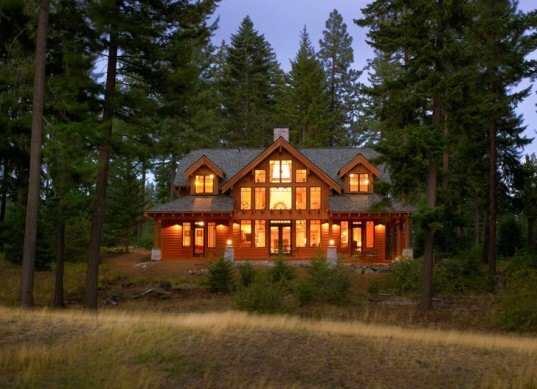 Pre-cut, panelized, post and beam, and log homes that come as a pack of parts fall into the “Kit House” category, offering houses that are shipped effectively as a kit of parts — ready for quick and efficient on-site assembly. On the other hand, the “prebuilt” category includes houses that are shipped (usually on the back of flatbed trucks) as pre-constructed volumes that can be joined on-site to form a larger home. 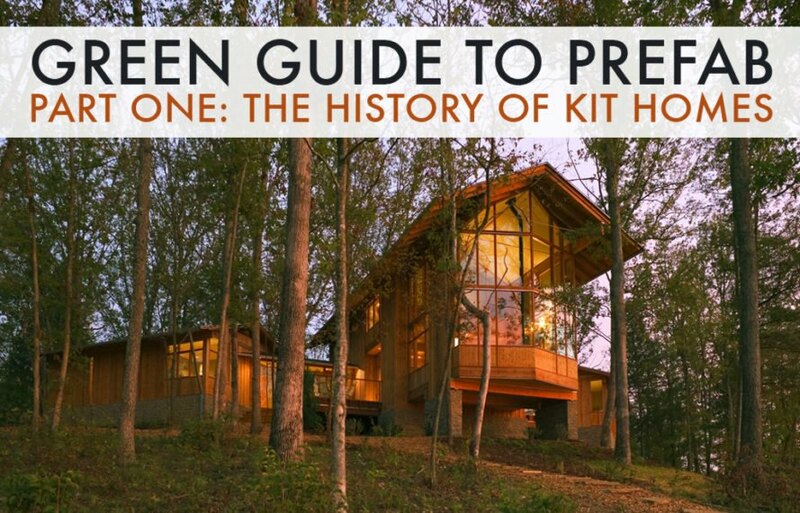 The first part of our series is a detailed exploration of the origin and development of kit-homes. If you’ve ever considered, or are considering, jumping onto the prefab bandwagon, here you’ll find the low-down on how a kit-house works, and the best approach to constructing a modern kit home. The birthplace of American prefab was in 1908 with Sears Roebuck’s pre-cut kit homes. This new iteration of the modern home offered hundreds of designs in a printed catalog and the possibility of a homeowner designing their own home — which Sears would pre-cut. Sears’ first ‘Modern Home’ catalogue offered 22 different kit designs and ranged in cost from just $650 to $2500 (20-60k in 2011 dollars). Sears’ offer gave Americans the popular styles they were seeking, as well as up-to-date floor plans that didn’t require an architect. The option was also easily constructible, coming in a package of framing and trim materials that arrived by rail. 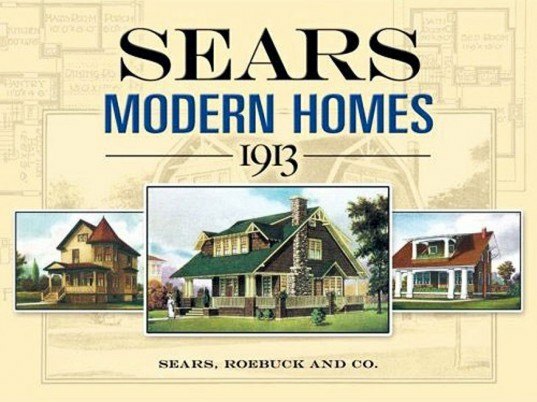 The style, the convenience and the savings that resulted from reduced design fees and efficient on-site framing were attractive enough to consumers to earn Sears over 70,000 customers between 1908 and 1940. More than just creating a space, Sears’ strategy was to eventually sell the home-building customer all the finishes, furnishings, plumbing and heating equipment — all which came readily available in the Sears main retail catalogue. Seeing the effectiveness of their plan, other mass merchandisers quickly followed suit. By 1920 kit houses were popular with consumers, but the movement lost speed when many homeowners naively thought they could save substantially by building their own home. This disastrous misconception was memorialized in the Buster Keaton silent movie, One Week, in which a newlywed couple attempts to build a kit home. The movie may be silent, but it speaks volumes to the hazards of trying to become your own general contractor — something that exists today more than ever. The lesson to be gleaned from this is that if building is not your expertise, don’t let a smooth-talking salesperson convince you otherwise. Instead, take the proper steps to construction now to save you heartache (and money) in the long-run. In 1937, Walter Gropius, Germany’s venerable leader of the Bauhaus movement, left pre-war Germany for the United States to become Dean of the Harvard Graduate School of Design. 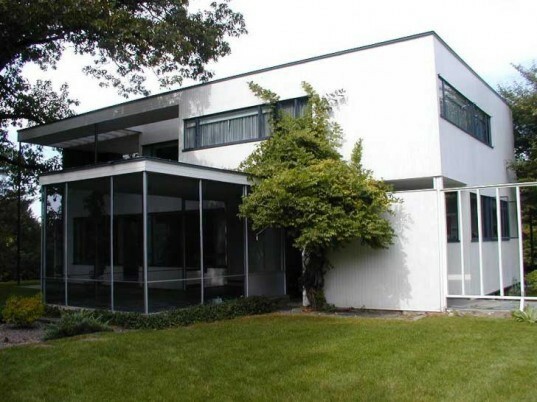 Beginning with his own modest house in Lincoln, MA, Gropius demonstrated the power of a built environment that is carefully mated to its natural site. The Gropius House, in the true European Bauhaus spirit, celebrated industrialization and was built of off-the-shelf industrial products not yet common in homes. In 1949, Carl Koch, a student of Gropius’, took prefab to a new level by creating an efficient building system. The new prefab consisted of a load bearing post and beam skeleton with ribs spaced on four foot centers, and prefabricated wall panels that fit between the ribs and were non-load bearing. Roof panels and large factory built windows fit neatly into the bays, and the efficiency of the building system was further enhanced by a fresh planning concept that incorporated the attic volume into the main living area. Koch also opened the basement to the daylight using it as secondary living space. Techbuilt claimed that their modern houses could save consumers 30-50% of the cost of a conventional home. Continuing in the Gropius architectural lineage, two of Koch’s architect colleagues founded Acorn and Deck House in Concord, MA. Meticulously designed post and beam building systems with their own architectural signatures, each came precut and panelized and was personalized to the building site and the client’s needs. Skilled systems designers created the efficient houses that utilized parts repetitively and efficiently, and reduced factory waste and on-site construction time. 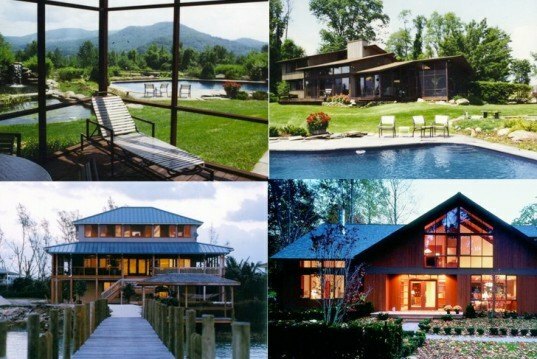 Acorn continued to flourish, and during the late 1970s and 1980s they became leaders in the housing industry in passive solar (Deck House) and active solar (Acorn) design, which responded to the oil crisis and federal solar tax credits. 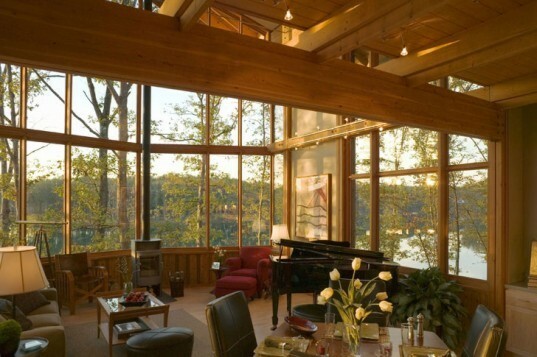 The companies’ reputations in energy efficient eco-sited houses led to innovative manufacturers to select these companies to pilot new products — the Deck House was the first company to produce windows with Heat Mirror film and later low-e glass. Housing manufacturers had the research and development muscle to lead where local builders and small architectural firms struggled. Acorn produced hundreds of houses with it proprietary solar collectors, Lord Rumford fireplaces, while Deck Houses produced hundreds with passive solar sunspaces, trombe walls, mechanical sunshades and early radiant floors. Housing manufacturers showed that system building could save consumers on design expenses, construction costs, and now energy, year after year. However, it was World War II that brought significant changes to the ideals of modernism. The rationing of commodities such as gasoline, and the retooling of industrial America from refrigerators and automobiles to the armaments of war led the country to a new American ideal; personal consumption took a backseat to the war effort. 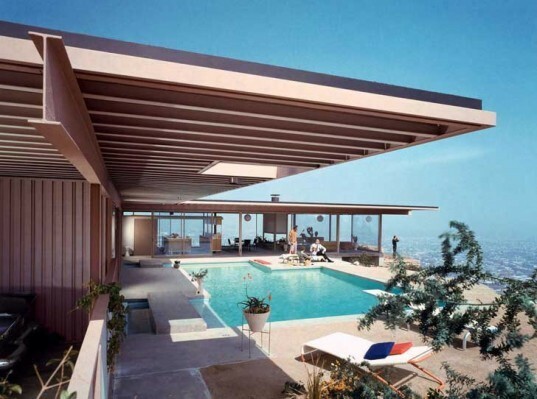 The Case Study Houses, designed and built by leading architects of the time in Southern California between 1945 and 1962, defined American modernism as a design strategy irrespective of form. In these terms, modernism is responsive to the natural, social and economic environment, and to the cost control and efficiency afforded by mass production. 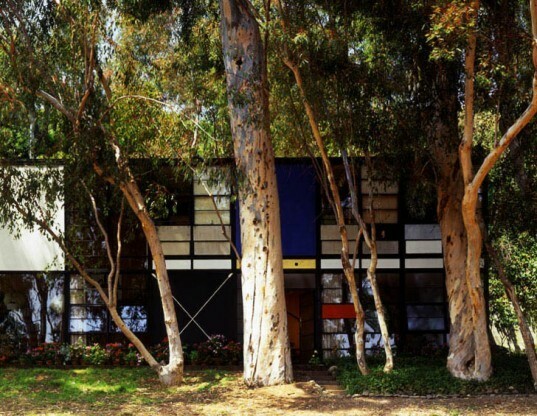 In particular, the Case Study House #8, built by Charles and Ray Eames, utilized only off-the shelf materials procured for a previous version of the design, which were then reassembled into a new design. The latticed volume is situated on a hillside, blending with the topography in order to preserve the meadow and furnish views across it. Case Study Homes such as this inspired a generation of modern houses built throughout North America that were optimistic yet restrained, efficiently organized, free-flowing and were sensitive to the integration of the natural environment; modern was no longer defined by flat roofs or chilling spartan interiors. American modernism became a celebration of responsiveness, order, and efficiency. Homes built of industrial parts reduced cost, trading frivolous adornment for openness and flexibility. Unfortunately, while the Case Study houses pledged efficiency, cost control, and were assembled from industrialized parts, the houses never were systematized and mass-produced. This failure largely attributed to the inability of architects to discipline themselves to design within a system of predefined parts and details, and the inability of manufacturers to create systems that provide for mass-customization or welcome the inclusion of new materials and details into their existing system. Professor Colin Davies chronicles and analyzes the failure of architects and producers to form long lasting and productive partnerships in his 2005 book, The Prefabricated Home. Like the Case Study homes, the early Lindal structures responded to the natural environment, they were open, flexible, practical and were efficient, post and beam homes. However, unlike the Case Study houses, they were created from one well-organized building system that today has been continually refined over the last 66 years. While the preafab movement was a seemingly successful endeavor in creating efficient homes, at the end of the twentieth century and the beginning of the twenty-first, the spirit of modernism and its homes slowly devolved into a very different “moment” where the markers of success and wealth were measured by increased square footage and telescoping gables. Where consumers led, producers followed; time, materials, and money were consumed as if they existed in endless supply, and emphasis strayed from resource-efficient prefabricated housing to excess. Stay tuned for our next two installments where we explore the roots of the “pre-built” home and how this faction of the prefab movement became a reaction to the ‘Age of Excess’. We will delve into the history of how these homes came to be, how they evolved, and how they’ve come to inform the prefabs we see built today by modern and green architects such as RES4, Marmol Radziner, Michelle Kauffman, and of course, those at Lindal Homes. 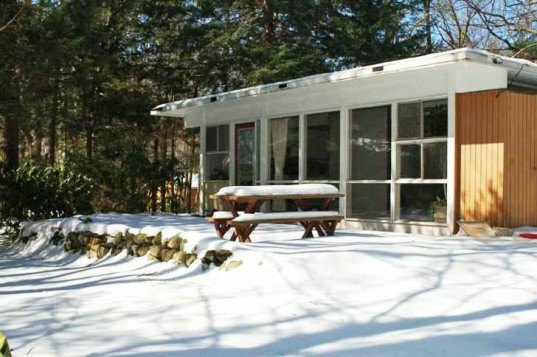 My grandparents built a Hodgdon prefab house in Cohasset, Massachusetts. It is still there-with a two-storey addition over the original dining room. When we visited, I slept in the living room and I liked to look at all the bolts in the ceiling. My girlfriend and I are negotiating with several prefab factories as to who can quote us the best price for our new house. Saying that a house is prefab does not mean it is a kit house! We've designed our house ourselves (with a lot of help), we had drawings made for ease of prefabrication. It is a completely custom and original design. I have always wondered if prefab homes would last as long as a regular house. I suppose each prefab manufacturer is different and each house is subject to a unique environment, but as a general "rule of thumb", which is more perennial? A fascinating read. I never really equated kit homes of the Sears Roebuck days with the prefabs we know and love today. Prefabricated housing has seen a surge in popularity over the last few years as an affordable, eco-friendly and modern alternative to custom stick-built housing or suburban tract homes. Although prefab construction has experienced a recent spike in popularity in this past decade, the idea of prefabricated building construction is nothing new - prefab designs have been around for over a century, embedded in the history of the modern architecture movement. In order to really understand prefab housing, we're going to dive into a history lesson and take a look back at the prefab home movement during the last century.